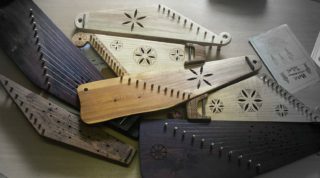 The kokle, the Baltic instrument alternatively known as the Baltic zither or psaltery, is not only an instrument integral to Latvian folk culture, but also a symbol of Latvian culture itself, mentioned in many songs, poems, and stories. Perhaps due to its relatively simplistic design, the instrument, though it had a history centuries long, was close to disappearing in the 19th century. It experienced a rebirth during Latvia’s first awakening, and has remained a part of the national consciousness ever since, even during the half century of Soviet occupation. Today this ‘simple’ instrument has become not only more popular, it comes now in many sizes and shapes, even electric, and a broad group of Latvian musicians continue to keep the kokle in the public eye. As a tribute to this most Latvian of instruments, the record label Lauska released the collection entitled Trejdeviņi koklētāji in 2016, celebrating the many facets and forms of this instrument in the performances of many of Latvia’s best known kokle players. The songs on the album are in many styles – ethno-jazz, ethno-baroque, minimalistic, and, of course, traditional, confirming the place of this ancient instrument in the 21st century. 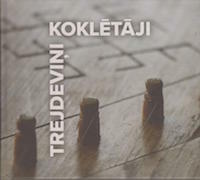 The name of the collection – Trejdeviņi koklētāji – means 27 (or three times nine) kokle players, and it is not the actual count of the musicians that appear on this record (though it is close!) The title actually comes from a folk wedding song, where, when the husband is searching for his bride, he comes across 27 kokle players who are able to tell him which direction to go. In other words, kokle players have an innate ability to show us all the correction direction to go in life. Perhaps the foremost kokle performer in Latvia today is ethnomusicologist Valdis Muktupāvels, who not only produced this album, but also appears on multiple tracks, including the first song on the album – the instrumental “Kurzemes zvani”. Inspired by time spent on the Swedish island of Gotland, listening to church bells, this tranquil and spiritual work captures the peace and calm of listening to church bells ringing in the countryside. Another young artist pushing the boundaries of kokle performance is Laima Jansone, who often produces lively and fiery works for the instrument. One of those is “Pavasara grīslis”, a picturesque and energetic work inspired by the spring sedge. Jansone is known for her dynamic performances, and this song is no exception – in its depiction of this plant it contains all the joy and rebirth of springtime. The album also balances the modern interpretations with more traditional kokle based performances, such as the song “Apkārtnīca” performed by the female folk group Laiksne. The group actually added the musical kokle accompaniment to the song, which is normally sung without instruments. This lively, exuberant performance captures the spirited nature of this song, about a journey through the town of Nīca. As with many releases from the Lauska label (which specializes in Latvian folklore), the packaging for this album is exceptional. It is in the form of a hardback book, and has extensive notes on all of the songs and performers, as well as an extensive history of the kokle itself, in English and in Latvian. This is supplemented by many fascinating photographs, with some dating to the 1930s and 40s. Altogether it makes for a fitting tribute to this instrument. 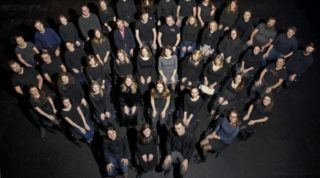 Collecting a broad range of performances from many of Latvia’s top kokle players, Trejdeviņi koklētāji is a celebration of the musical instrument which perhaps most accurately defines the national psyche. At once simple and traditional, but, at closer glance, varied and multi-faceted, the instrument, in the hands of one of many of Latvia’s talented players, comes to life with its distinctive sound and texture. The legend of the three-times-nine kokle players, though ancient, is still quite relevant in these modern days, as shown by the extraordinary performances on Trejdeviņi koklētāji. For further information, please visit the Lauska website.